Belgaum is nestled between nature and we are very lucky to be so near to nature. In the monsoons there are many places that can be a great spot for a trip. 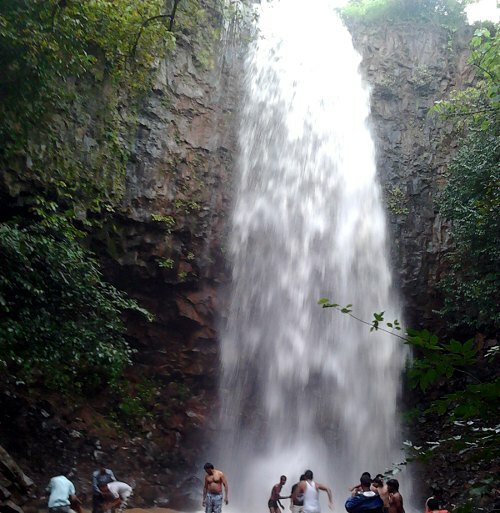 Here is one shared by Mr.Vijay Dani, the Sundi Water falls near Mahipalgad. The water falls has some crystal clear water falling from about 50 feet and the sight is awesome. The water depth near the falls is not much hence one can play in the water as well. Even trekking can be done and this falls could be covered as a day trip along with Vaijnath & Mahipalgad. As these places are not developed one needs to carry along all the food and potable water. Stop your vehicles near the make shift Tea shop and take a Right turn into the fields. Walk for less than a km through the fields. Go down the hill on a some what difficult terrain with stones (water bed) to see Sundi Falls. Plz suggest which place is good sundi or surla!! Which is better this or sural falls ?? Another beautiful place lost to people.. I had visited this place last Sunday.. Only to see more than 100 bikes and 15 cars and jeeps.. Almost everyone were drunk college kids and creating such a ruckus.. some were littering the place.. I felt bad for the poor farmer who was tilling the field and wondering what all the fuss was about..